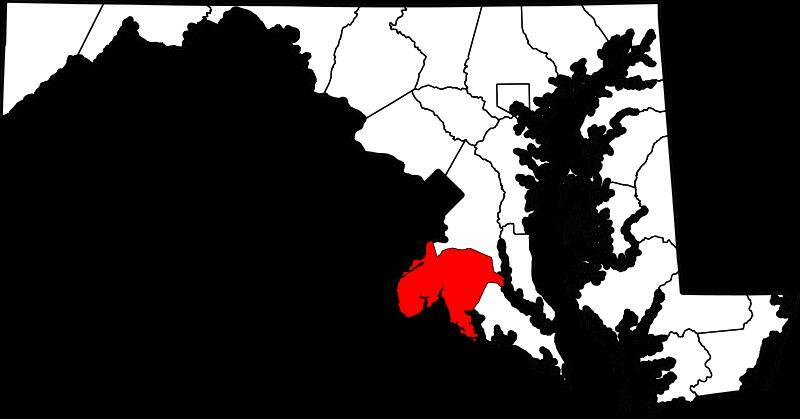 Charles County borders Virginia and was established in 1650 (see present day map for location). Daughter Susanna married Robert Whitely who died in 1744. She then married Henry Taylor, a widower in Fairfax Co. VA. Daughter Eleanor (Elender) married John Slye, 1694/95-1777. In his will written Mar 19, 1744/5, Matthew specifically left his son Samuel all of his estate that Samuel possessed in what became Loudoun Co. Virginia, along with 2 shillings sterling. His remaining real property went to his son Matthew Jr., two daughters and a grandson. Summary of the Will of Matthew Compton Sr.
Loudoun Co. Virginia borders Maryland and was established in 1757 from Fairfax Co. Western settlement began in the 1720s and 1730s (see present day map for location). "Matthew COMPTON I", in "Descendants of John F. Compton (Bef 1644 - Aft 29 May 1713 and Bef 5 March 1718)" , website. Russell, George Ely & Donna Valley Russell, ed., The Ark and the Dove Adventurers, Genealogical Publ. Co., Inc., 2005, pp. 20-29. Will of Matthew Compton I, Charles Co. MD, SLC Fil #13761, Will #4 1734-1752, pp. 235-236, Liber 25, Folio 150, Mar 19, 1744/45.